Willow It's quiet... too quiet. Eels may look like a snakes, but they are actually fish. There are over 800 different species of eel. Freshwater eels are known to travel as far as 4,000 miles to breed. 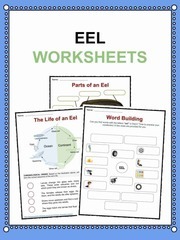 Click for more Eel facts or download the comprehensive worksheet collection.